Excerpt: Although preferring a 100% conservation solution, the Trust Society’s “Wild Coast Plan 2” campaign is an effort to secure as much protection for the Cape’s most fragile ecosystems as possible if development should occur. Two years ago Kingfisher reported on efforts to preserve the unique Cape Roger Curtis property, often referred to as “the jewel of Bowen Island.” Since then, the Cape Roger Curtis Trust Society, the Bowen community, and several nature-related organizations have continued to advocate strenuously for preservation of this magnificent 631-acre coastal wilderness. Located at the southwest corner of Bowen, the Cape lands comprise 3.7 km of pristine coastline; coniferous and deciduous forests; coastal bluffs with a mosaic of Arbutus, Rocky Mountain Juniper and wildflower meadows; riparian areas; and mussel and eel grass beds offshore. Although only 20 km from downtown Vancouver, the Cape is home to plant communities which are rare in BC, and supports a variety of threatened, endangered and locally rare species. It remains, for the moment, the only undeveloped ocean-side property of this size and splendour so near the metropolitan area. Most recently, the Cape’s owners and Bowen Municipality have been engaged in an informal, voluntary comprehensive rezoning process. If this process produces a result acceptable to all and the Islands Trust, the outcome may be both a clustered residential development and a very large park at the Cape. The owners’ planners (Ekistics) have expounded their preliminary Concept Plan at a series of public meetings. Although an official proposal has not yet been submitted for municipal action, Ekistics’ Plan includes: donation of up to 60% of the land (including 100% of the shoreline) to be set aside as a park and/or nature reserve; and clusters of development to include single family homes, multifamily condominiums, affordable housing, an inn, a store, a school, a playing field and a seniors’ age-in-place home. This Plan appears at first to have many attractive elements; however, the huge problem facing Bowen is the high price it would have to pay. The owners contend that to provide these amenities, they need to profit from 1,000 units for full build-out over the next 25 years. Contrast this with the fact that only 58 10-acre lots would be permitted under current zoning, and that Bowen’s Official Community Plan envisions a maximum possible build-out density for this property of no more than 224 units! Although preferring a 100% conservation solution, the Trust Society’s “Wild Coast Plan 2” campaign is an effort to secure as much protection for the Cape’s most fragile ecosystems as possible if development should occur. This plan suggests that the development could be much better adjusted to the Cape’s ecological values and meet Bowen’s needs and public interest if the parks and greenways aspect of the plan were further expanded. 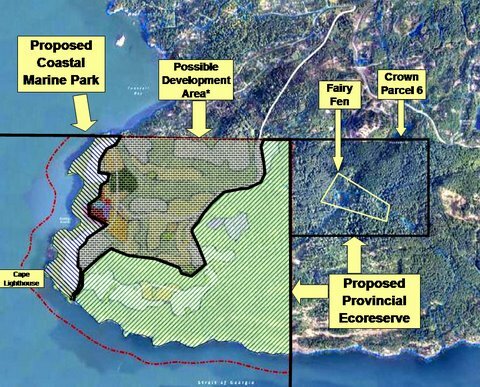 The map shown here is the Trust Society’s latest Wild Coast Plan, created by superimposing its alternative proposal over Ekistics’ preliminary Concept Plan (for purposes of comparison only). With Crown Parcel 6 (including the Fairy Fen wetlands—see related article in this issue) immediately to the east of the Cape parcel, it should be possible to leverage creation of an even larger contiguous area than that offered by the Cape’s owners—or, more precisely, a waterfront recreational park with inland greenway/trails and a large provincial eco-reserve. This outcome could permanently protect almost the entire watershed of the Fairy Fen wetlands. Many on Bowen would also like to see a marine conservation area surrounding the Cape to protect marine ecology and therefore the over-wintering waterfowl and their food supply. The Trust Society is urgently seeking technical and financial assistance from other NGOs and agencies to achieve the Wild Coast Plan 2. This irreplaceable natural heritage will be gone forever unless we act. Like Stanley Park in Vancouver, Cape Roger Curtis should be considered a regional treasure. While many in the community consider it unrealistic, the declared intention of the owner/developers is to achieve formal rezoning of the Cape by March 2008, so decisions made in the next few months will be crucial to the success, or failure, of its conservation. To learn more, or if you or your organization can offer any assistance, please visit www.caperogercurtis.org today. ‹ Who answers to our grandchildren?